*Fully a week late, I would like to state that due to various technical difficulties, this post has taken FOR EVER to finish! Yes, I am embarrassed. Let’s move on. Megan was so excited to have her birthday be the first day of school. She has been looking forward to kindergarten so much. Monday was a giant day-long celebration. She beamed as we all walked her into the classroom. I think Michael and I were more nervous than she was. She confidently found her seat and began assembling blocks–then didn’t even notice us as we left. That’s my girl! After school we opened gifts and played with new toys; including an avalanche of new Barbie playsets delivered by our own personal fairy godmother. We love you, Juli! Needless to say, these have pretty much been the big hit around our house for the last week. 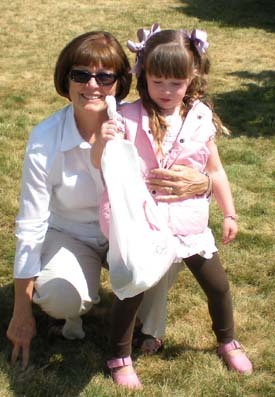 Then we headed over to the swim club for Grandma Verna’s swim party. What could be better on your birthday: swimming with cousins and eating pizza, pink cupcakes, and soft serve ice cream? What a day! She also had her first fishing trip with Dad. Although they didn’t catch anything, they had a great time. Megan has been “practicing her casting” a ton. I love it! 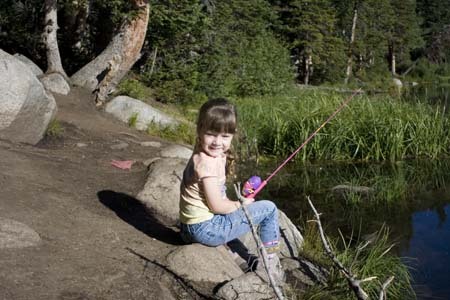 She and Michael have had a ton of fun this summer, camping, backpacking, and now fishing. He is such a good daddy! We had a Strawberry Shortcake water party on Saturday. The girls had a ball. (Megan specified that only girls were invited this year. If any boys came, she said that they would have to wear a baby costume. Okay then!) Surprisingly, 13 five year olds (plus Emily) was pretty manageable. We have a boatload of darling girls in our neighborhood. I feel so lucky to have Meg! She is my big helper; she’s so eager to do anything she can to help out around the house. Often she’ll run to close the gate or get me something, saying “I want to be your helper!” It definitely makes my life easier. She has such a sweet and loving disposition and is so quick to tell us how much she loves us. Which also goes for her relationship with Emily. They play so well together. Our pediatrician said that they “get along uncommonly well” as he watched them play during her check up this week. It is true, they are awesome sisters. Megan has a hilarious sense of humor and I love the funny laugh that she does when she is really amused by something. She is also one serious drama queen. She and Emily play out elaborate scenarios (where she is almost always a princess) When she is hurt, boy, the world knows it! It’s hard to believe she is five, she is wonderful! Happy Birthday (a little late) sweet girl! Sounds fun, but you sure are brave to have 13 little girls over! Cute pictures! She looks like you! What a doll! Andrew and I were kicking ourselves that we didn’t see your family last week. Please forgive us. We only had four days in Salt lake… poor excuse, I know. It would have been great to get our hubbies out fishing with our girls together. It sounds like she’s adjusting to school with ease (no surprise there right?) and is still as adorable as ever. I’m glad you’re doing well, happily residing in Barbie heaven. Wow. You were really brave to have all those girls over. There’s enough drama at my house with just my 3 girls, and occasionally a friend or 2. Happy birthday to your Megan and my Jonas! It seems like just yesterday, we were graduating and you were pregnant! She is such a little cutie and you are such an awesome mom. Hope you are feeling well. I miss you, still bummed we didn’t get to meet up when I was in UT! 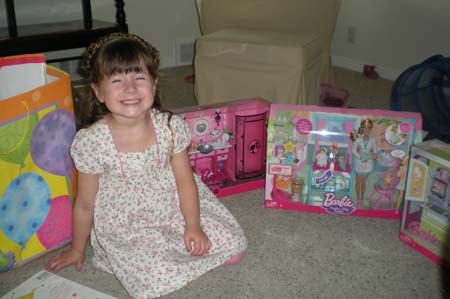 That smile was worth a great deal more than the Barbies! I think you are amazing for doing all you do and that you sell yourself way too short. Besides….you are the best art teacher in the world and I appreciate you to pieces. I love you and your whole family very very much! Can’t wait to meet the baby!!!!!! !